So what do I know about figures? Well, I know that they come in all sizes and all shapes. I also know that they are something I like, but build few of. Actually, I guess the key to figures is painting so perhaps the building part is very much a minor part of the deal. This is from an American company with a rather British sounding name. Either that, or American labor is becoming cheap enough to have figures made here as the the box touts 'Made in the USA' on the bottom of it. 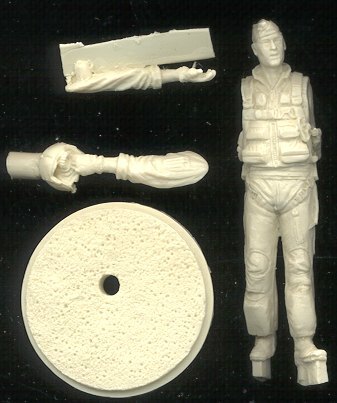 The figure itself is a Vietnam War-era F-105 pilot in 54mm. 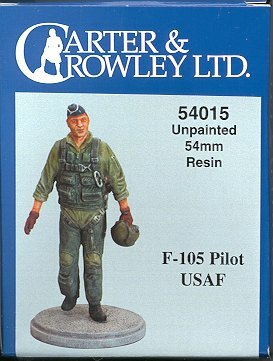 Now I do believe that equates to about 1/32 scale so this one is perfect for placing next to your Trumpeter F-105. You do have at least one of them, don't you? If you take a look at the nearly twice full size image above, you'll see that this figure is superbly detailed and almost free of flaws. I found a teeny air bubble on the wrist of the hand holding the helmet and there is a touch of mold line on the inside of the pilot's legs that may concern you, but other than that, it is pretty well ready to go. The resin is shiny so I'll have to assume that this is the mold release agent that will have to be washed off prior to painting. The attachment points are all quite positive so no worries about misaligning anything. Test fitting the one arm showed that there will be nearly no discernable gap. The base represents a standard concrete surface and pitted just the way I remember tarmacs in the tropics. Parts come protected in a bubble bag so there was no damage. Painting info can be taken from the box which shows a rear view on the other side. There is also a small slip of paper that gives pertinent color information for the various parts of the figure. Overall, an excellent figure and one that would be perfect either as part of a diorama, together with your huge Thud or as a stand-alone project.